Time magazine named Alice Waters as one of the 100 Most Influential People of 2014, and with 14 books and a slew of awards and honours, the 71 year old is probably the most celebrated food personality in the US. She will be at the Ballymaloe Literary Festival this weekend and will be on stage, talking to John McKenna on Saturday morning. Famed for her award winning Chez Panisse restaurant in Berkeley, California which she opened in 1971 with business partner Paul Aratow, her food philosophy has always focused on using local, seasonal, organic produce, something she learned from her time spent in France as a student. It may sound old hat now, but when she started out in the 70s, no one in the US had realised the benefits of sourcing food directly from the local farmers. Her primary aim was to get food that tasted great, so she says that she accidently discovered that organic food was best. 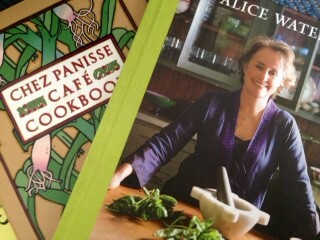 And, similar to what she had seen in France, at Chez Panisse diners were offered just one set menu. It changed daily and there were absolutely no choices. Despite its low key, hippie beginnings as a place for anti-Vietnam and free speech campaigners to meet and discuss the politics of the day, Chez Panisse went on to become one of the most sought after restaurant reservations in the US, and featured on the World’s 50 Best Restaurant list from 2002 to 2008, ranking number 12 in 2003. “It’s really wonderful to be globally honoured, there is no question about that,” says Waters. “I think the restaurant is always a kind of work in progress, I don’t feel like we get an honour and then it feels like it’s a ride. I’ve never felt that. I feel that when it doesn’t have that challenge it loses some of its life. So it’s just endlessly challenging to me. “In a way, it’s somehow come full cycle. It started out as a place where my friends could come and sort of talk the politics of the day, and we had a time 20 to 25 years ago when it felt like it was more of an international restaurant,” she says. “But now it’s very much part of the community again. Although the weekend dinner menu at Chez Panisse, which still offers no choice, will set you back $100, Waters has always advocated that good food is a right for everybody. Partially because of her training as a Montessori teacher, she has always had a very holistic view about how an appreciation of good food and cooking can be incorporated into a school’s curriculum. In 1995, she set up the Chez Panisse Foundation and through that set up the Edible Schoolyard programme, a one-acre organic garden and kitchen classroom at Berkeley’s Martin Luther King, Jr Middle School, where young teenage students learn how to grow, harvest, and cook the produce from the garden. While this project has now been running for 20 years, it took this quietly spoken revolutionary time and tact to persuade the teachers of the efficacy of the idea. She did however, have one trump card in her apron pocket. “We began very slowly; planting the seed in people’s minds,” she says. “And then after a while, we invited the math and science teachers to have a meeting over lunch at Chez Panisse, because we felt if they were in a different circumstance, they might have a different conversation, and in fact they did. They were won over. And they figured out how to use the garden and the kitchen for their own teaching purposes. It was beautiful. It look longer than we imagined, it took a couple of years to make that really successful, but once it happened it became part of the curriculum of the school.” Over the years, this has grown to include the online Edible Schoolyard Network (edibleschoolyard.org) which gathers and shares lessons and best practices from school gardens, kitchens, and edible education programs worldwide. To date, there are more than 3,700 ESY Network member programs in 53 countries. More recently, Waters has been credited with being the inspiration behind the organic vegetable garden planted by Michelle Obama at the Whitehouse. “I think Michelle Obama knew a lot about my work even before they went to the White House,” she says. “I had an opportunity to speak about the idea of a garden I had been campaigning for. I think she just felt empowered to take it on, and she did that. And I’m so glad she did it so quickly because those pictures went around the world, and it came just at the right time to the administration. I think that was one of the most beautiful chapters of the administration; her planting a garden and choosing to invite children to the White House to help her do that. I never expected it would happen but it did. I know privately that they eat from that garden, but I’m sad the caretaker of that garden has left the White House. I hope the garden continues, I’m sure it will but it needs to be the priority. “She is always thanking me for helping her, that I certainly, spiritually was part of that garden in a way. It just goes to show what a very small action like that can do to the country, in the right place at the right time. That’s why I’ve always gone after the mayors of cities to build something where it says we care about feeding people, we want to feed them food from an organic garden; I mean it just takes on a whole dimension,” she says. For Waters, the campaign for better food never ends. She has been advocating for an improved school lunch programme in the US so that every child enjoys the benefit of a good meal, and she has constantly tried to shine the light on the negative impact of fast food; how it impacts on health, the welfare of animals and the community as a whole. “I’m not trying to overthrow anything, I’m trying to really win people over, which is very different,” she says. “It’s kind of the slow food mantra. And I guess when there’s bad behaviour you don’t scold the child. Instead, you create a circumstance on the other side of the room that’s very enticing and positive, and the child is inclined to join. The more the child is empowered the less he acts up. I believe in that, I ready do. I think people have been imprisoned by this fast food culture that we live in. They are really hungry for a different kind of life, and so when we create that circumstance and we invite people to come in and to come back to the table, they are opened up in a way. A. Taste and taste again! Q. What chefs have inspired you? A. Lulu Peyraud, Darina Allen, Elizabeth David, Richard Olney, Cecilia Chiang, Madhur Jaffrey, and Diana Kennedy. A. I always like cookbooks that have great writing and are connected to food traditions. I also love cookbooks with photographs that really feel authentic; I like to see where I am. Diana Kennedy does a beautiful job of that, and always captures the feeling of the places in Mexico she’s writing about. Claudia Roden’s books are also always wonderful—both for her writing and the images. And though it’s not a proper cookbook, I love The Magic of Fire, by William Rubel. A. Any non-organic ingredient! Or anything that’s out of season, like a supermarket tomato in the middle of winter—that I particularly dislike. A. Garlic, olive oil, and good oven-baked bread. I love them all for their flavour, of course, and for their profound versatility. A. A mortar and pestle, cast iron pans, and sharp knives. A. Preserved organic tomatoes—you can make a beautiful sauce in a moment with them. Good extra-virgin olive oil and red wine vinegar are also essentials. Farro pasta is wonderful, too—I find it very tasty, and it’s a whole grain. A. Put a grill in your fireplace! Don’t be afraid of cooking in your living room—it makes the whole house smell good, and there’s nothing like the flavour of something that’s been cooked over the fire. Q. What is the secret to a great restaurant? A. Pure ingredients, simplicity, and friendliness. Q. What are your favourite restaurants and why? A. I love restaurants where I can go in and sit at the bar for dinner if I’m by myself—places that feel welcoming and homey. I feel good about a restaurant if it has a really great aroma when you first walk in–and I always like when I can see what’s going on in the kitchen. And of course I like to go to restaurants where I know the people that are running them—when I know that they care about real, pure food and where it’s coming from. Sugar… Food Enemy Number One?